The retail release has compatibility issues with modern systems and lacks widescreen support (see SoFplus). SoF Things - A user created fan site for SoF Singleplayer and Multiplayer, as well as working bug fixes and patches. liflg.org - SoF game installer for Linux (includes the 1.06a patch). Simple disc check. Regular, Gold Edition Or Platinum Edition. For the Windows version, install the Gold Patch (if using the original retail release) followed by the v1.07f Beta patch. 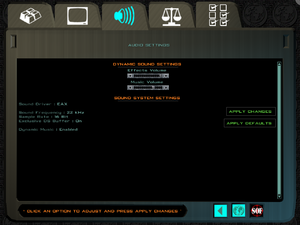 For the Linux version, install Patch 1.06a to get the Gold content and other updates. 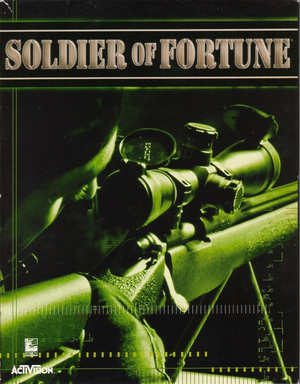 SoFplus is a fan mod for Soldier of Fortune 1.07f, which adds new features and solves problems with modern systems. On by default but can be forced off. High frame rate may cause your character to slide across the floor when moving. Cap the frame rate at 60 FPS. Forced on by default. 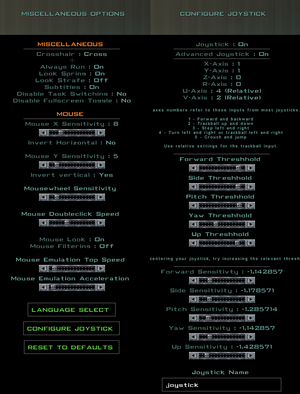 See Mouse acceleration. Apply The MarkC Windows 8.1 + 8 + 7 Mouse Acceleration Fix. Set set m_cursor_accel "1" to set m_cursor_accel "0"
32 More than 18 players may crash the server. Use the SoFplus dedicated server. Download the ref_gl.dll file from SoF Things website. Extract the ref_gl.dll file inside ref_gl_fixed.zip file into the installation folder, replacing existing files if prompted. Add gl_dynamic 0 and save. When moving, your character will slide across the floor.